If you are a wedding planner, you might have thought of taking your business online to target the global audience. Here are some of the best wedding planner WordPress themes that might help your business go digital. 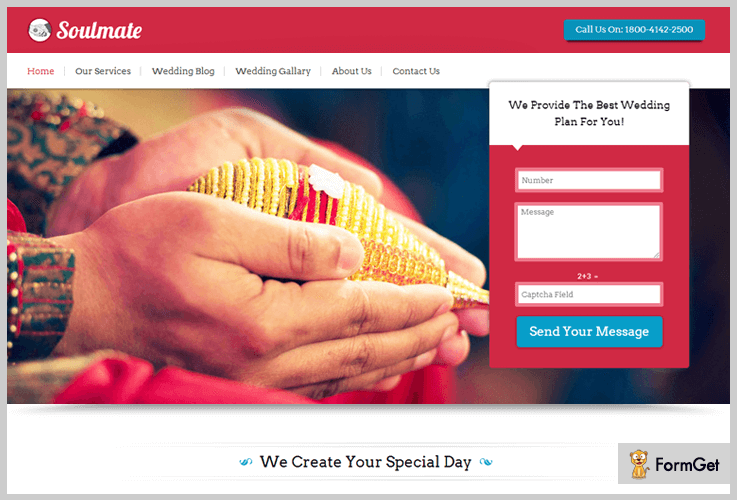 With these WordPress themes, any non-technical person can easily create attractive wedding planning websites. All these themes are pre-equipped with various appealing features like custom design, responsive layout, gallery to display photos, video section, blog area, plus you can also integrate google maps on your website. If you are a professional wedding planner who is looking to increase your business through the online platform? In that case, dream wedding WordPress theme is the best option for you to start with. This theme is designed in a way that gives you the option to feature your wedding services like venues, attires, and decorations through stunning images in the gallery. View some more features below that you will get in this theme. This theme will charge $79 and will give you a beautiful template which comes with 24/7 support, developers license, and multi-purpose usages. Homepage slider area which consists of 6 slider images, with a different text description on each slide. You can describe all your services like event management, decorations or catering through this feature. It includes a unique blog page with an option to add a variety of images along with a wedding topic to share with your visitors. Inbuilt contact us form which helps your customers to reach your business. Widgetized area at the footer and sidebar, along with the special private menu. Available in 10 different color palettes. Songs are an important factor for every wedding. If you want to display your large collection of popular music through a website, Wedding DJ is the right spot for you. This theme consists of an inbuilt SEO, that will help your website rank high. It also supports the shortcode feature that helps you create colorful buttons and multi-column text. It is available in 10 different color schemes. Grab this theme for $79 and you will get 24/7 support along with free installation and lifetime membership. Full width – 5 image slider along with text to convey your business punchlines. 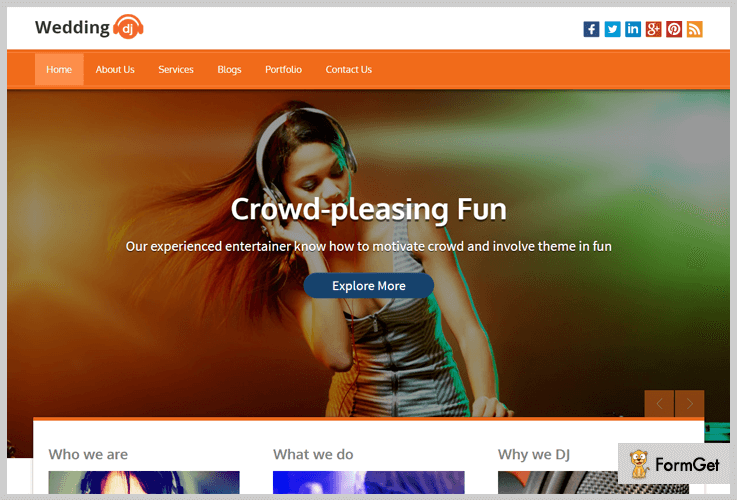 3 column featured area on the homepage to showcase your business services like provision of music mashups, after party services or other technical requirements. Special video area to include popular music videos. Separate page for your blogs so that you can share some interesting facts about disc jockeying with your visitors. Makes your customers reach you out easily through the contact us button on the homepage. Widgetized footer helps you to include things like search panels, portfolio images, videos and contact information and more on every page. Are you a wedding planner trying to set up a beautiful WordPress wedding website? Or looking to create a wedding website for your special day? 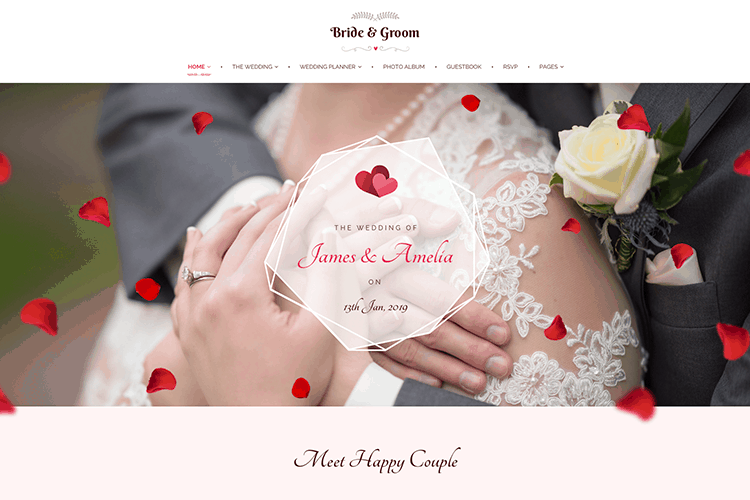 Bride & Groom theme by Themeum is a Gutenberg compatible theme that keeps both wedding planner and personal wedding websites in mind. It comes with 2 elegant demo variations- Personal and Wedding Planner. The theme is full of essentials like RSVP, countdown timer, event sliders, testimonials, wishes & remarks, photo gallery and so much more! The theme comes with an assortment of customization options. It includes the highly functional WP Page Builder which has 30+ addons and predesigned blocks and layouts. You can have an amazing navigation system with mega menus powered by WP Mega Menu. The theme is also WooCommerce ready in case you want to add a wedding shop to your website. Get this WordPress theme for just $45 with perks like 1 domain use, 1 year priority support, 1 year theme and plugin updates. Display layout in box-width or full width. You also get great styling options such as changing colours, background colours, background images and more. Includes a number of useful built-in pages to ensure that you have the highest utility. For example, Events, Bridesmaid & Groomsmen, Guestbook, Photo album, shop, blog, etc. Comes with a whole set of BrideGroom options for customizations such as typography, styling, pages and more. Increases functionality with WP Page Builder, a responsive and fast drag & drop page builder. Special Bride & Groom theme addons with WP Page Builder that include gallery tab, event sliders, bridegroom services and more! Integrate Google Maps to make sure visitors find venues easily. If you are a wedding agency that plans the typical “Traditional Hindu Wedding”, Soulmate will be the best theme for your business. It helps you list a number of wedding services like matrimonials, reception venues, beauty salons, photographers, caterers and decorators through a special 4 column service description area. Get this amazing theme with a 24/7 support and lifetime membership for $79. We also provide you with 30 days money back guarantee. Lead capture form will help you collect customer details and manage them from WordPress dashboard. Includes a separate blog page through which you can share wedding stories, different wedding options, and other related thoughts. Consists of a beautiful wedding gallery, where you can share images from different weddings. Widgetized area with the social icons at the footer and at the side panel. The theme also features a separate contact us form which also holds contact details and a tap to call button. GreenWedding theme enables you to keep a collection of all the popular Wedding Venues on the listings page. 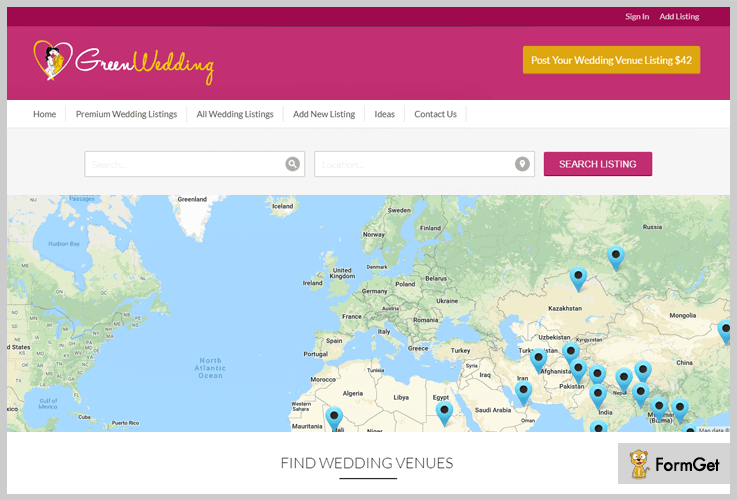 It is fully integrated with the Google maps that lets you choose a perfect location for the wedding, be it beaches, banquet halls, gardens, resorts, etc. This theme also lets you collaborate with other related business services like catering, decorators or matrimonials. In this way, you can provide your customers with all multiple options under one platform. This theme is available in 7 different color for custom styling. Get this WordPress theme for just $79 and avail services like free installation, 24/7 customer support, and 30-day money back guarantee. Search boxes at the homepage that helps you find your favorite venue listing. The theme includes a four-column featured area to showcase your venue categories. You can also display recently added blogs and posts on the homepage. The theme also provides you ad banners space, where you can display advertisements of different business listing. A widget area at the footer and sidebar along with a separate contact us page is also available. Photographs are a memory for every event, and when it’s about the wedding, people like to get clicked and cherish their moments. 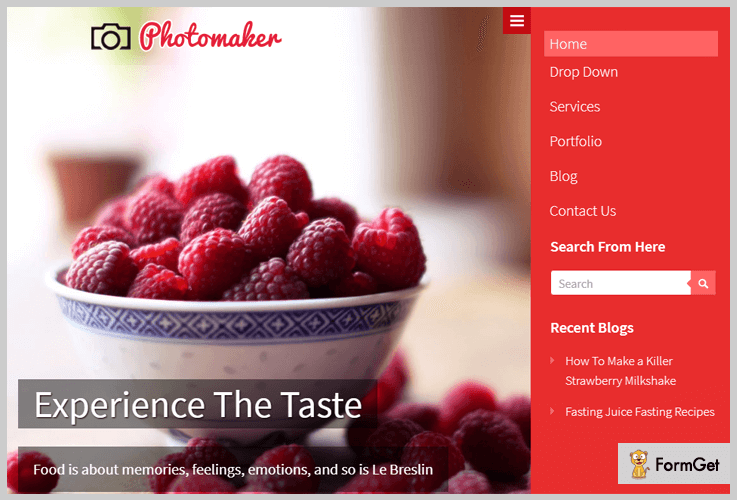 If you own a photo lab and want to go digital, Photomaker WordPress theme is the best option to start with. The Photomaker theme comes with the featured images option, that will easily grab the attention of your visitor. You can easily download this WordPress theme free of cost from wordpress.org. Custom menu with an on-off feature on a click of a button. Fascinating portfolio feature, with the image type – sorting buttons. Extraordinary blog feature with six different options that include – gallery images, slider images, and videos. Inbuilt contact form, so that your visitors can easily reach with messages and queries. Available in 12 different color skins. One page is a free WordPress Theme, that lets you go through all the Wedding Options on a single page. Be it blogs, photo gallery, testimonials, or contact section, you will find everything on the same webpage. This WordPress theme is available free of cost and can be downloaded from wordpress.org. Customize the important sections, like blogs, service details or contact information on the website. Fully customizable slider, that can adapt the changes according to your requirements. One Page theme includes a beautiful gallery with hexagonal portfolio images. This theme is translation ready visitors can easily translate the website into different languages. 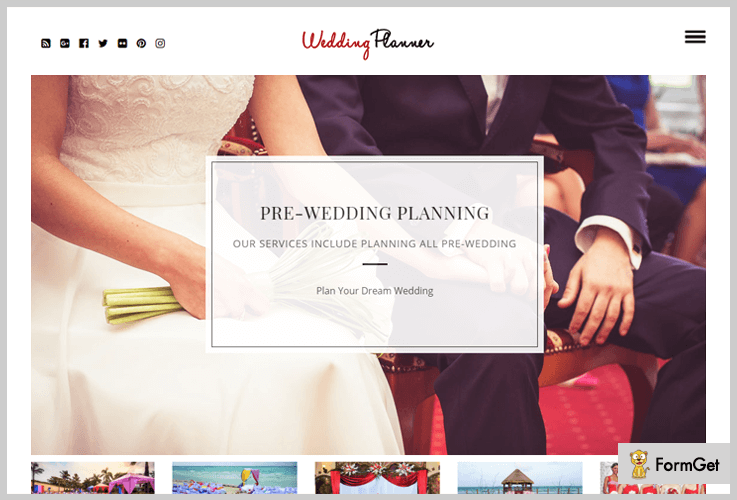 Now, these were some of our selected wedding planner WordPress themes. 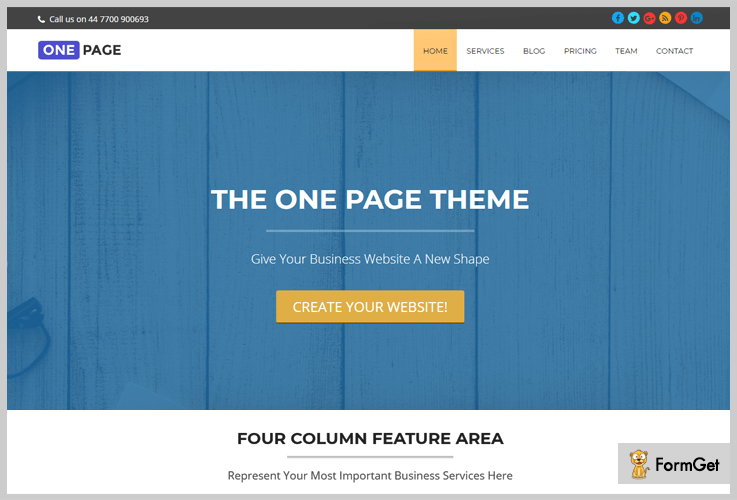 If you want to create your own website, you will love these themes. All of the above themes are fully responsive in nature. You can easily run them on almost all of your modern devices. These themes also possess cross-browser feature. They are fully compatible with all the latest browsers such as Mozilla Firefox, Chrome or Safari. Make Sure to choose the best because “It’s all about First Impression”.